Since its founding in 1964, the United Republic of Tanzania has used music, dance, and other cultural productions as ways of imagining and legitimizing the new nation. 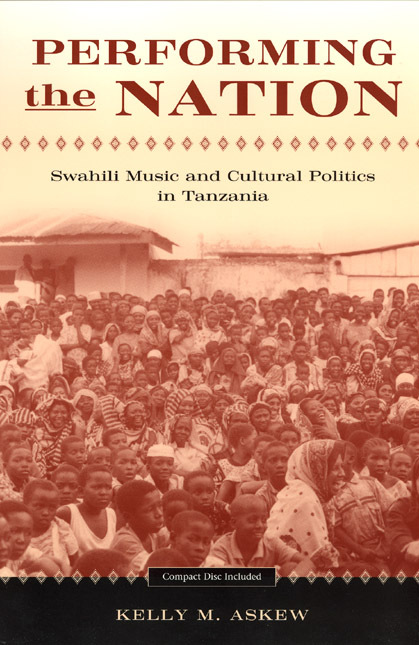 Focusing on the politics surrounding Swahili musical performance, Kelly Askew demonstrates the crucial role of popular culture in Tanzania’s colonial and postcolonial history. As Askew shows, the genres of ngoma (traditional dance), dansi (urban jazz), and taarab (sung Swahili poetry) have played prominent parts in official articulations of "Tanzanian National Culture" over the years. Drawing on over a decade of research, including extensive experience as a taarab and dansi performer, Askew explores the intimate relations among musical practice, political ideology, and economic change. She reveals the processes and agents involved in the creation of Tanzania’s national culture, from government elites to local musicians, poets, wedding participants, and traffic police. Throughout, Askew focuses on performance itself—musical and otherwise—as key to understanding both nation-building and interpersonal power dynamics. 5. Cultural Revolution in Tanzania?